How refreshing that in an age of corporate hotel chains that we can highlight a place that has been owned and managed by the same family since the 16th century. Repeat, the sixteenth century. Whether or not this constitutes some kind of record we cannot ascertain, but it really is a notable accolade. During those years, this Bavarian inn has welcomed some famous names: Tchaikovsky, Nietzsche, Mark Twain and Toscanini among them. 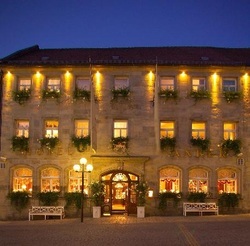 Located close to the centre of the capital of Upper Franconia, the Goldener Anker (35 rooms) remains a pleasantly intimate hotel.